Happy Not Really Monday, everyone. The American markets are back open, we’re getting our hands around the full-return of the second quarter, and hot dang do we have a new IPO filing to read. What more could you ask for? Aside from another day dedicated to grilling and explosions, I suppose. Today you and I will stroll through Talend’s F-1 filing that should float its shares on these shores, and unspool an interview that is more than worth our time. Talend, a French big-data shop with offices in Redwood City, intends to go public on the NASDAQ. The company’s offering comes after Twilio’s successful flotation, Brexit, and Line’s aggressive pricing of its own IPO. The company has several things in common with Twilio that investors may find heartening, most importantly a declining year-over-year net loss. 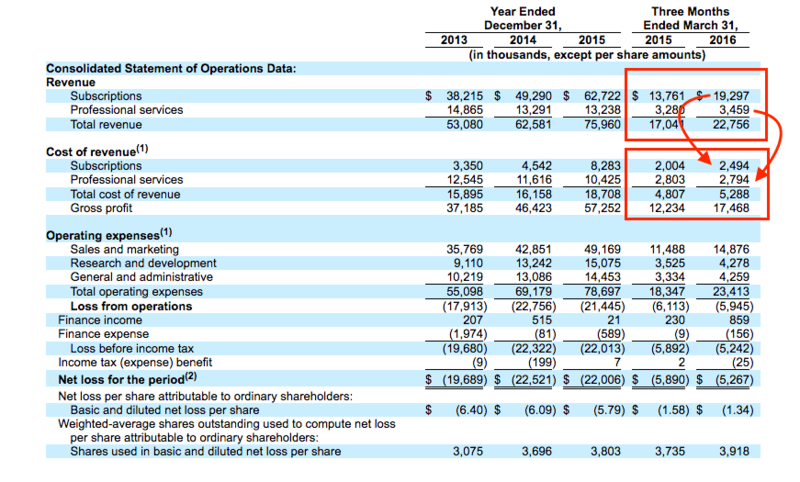 That, and growing revenues put Talend on a path to both breakeven and larger size. Talend also has something in its favor: Accelerating revenue growth. The company grew its revenue just over 20 percent in 2015 compared to the 2014 period. However, in the first quarter of 2016 that delta grew to more than 33 percent. So, while the company managed to slow its net loss by more than $600,000, Talend bolstered its growth rate. Not all is beautiful. The company reported less than $10 million cash and is growing at a fraction of Twilio’s pace; while Talend and Twilio share some broad strokes, it is clear that Twilio is by far the more quickly growing company. You can handicap the price, and expected first day performance of Talend accordingly. I don’t say that to be overly negative, but to set proper expectations. If Talend manages a first-day performance akin Twilio’s it will have mispriced its offering price. Finally, why do companies sometimes discount their services revenue when discussing revenue growth and commensurate profit performance? Now, which of those ratios generates a higher gross margin? Aha! As last week came to a close, Business Insider’s Matt Rosoff published an interview with LinkedIn chairman Reid Hoffman, a timely exchange given the recency of the deal between that company and Microsoft. Hoffman asserts that a company’s business model isn’t reinforced by its mission, but the other way around. Therefore, a company can’t execute its mission if its business model is contrary to those goals. That’s simple enough. Hoffman also dissects shareholder return from business model. Instead, in his conception, a company’s business model holds up its mission, which in turn delivers shareholder return. Summing, a company’s business model is merely a means to helping its mission drive value for shareholders. The idea makes sense when put in that form. Now, off you trot on this Fake Monday. More coffee for you! Featured Image via Flickr user rhodesj under CC BY 2.0. Image has been cropped.